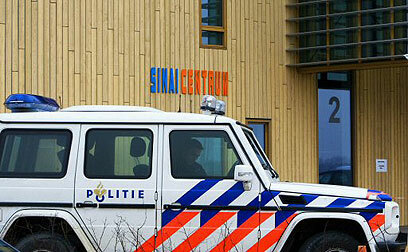 Shots were fired at a Jewish center in the Dutch town of Amstelveen, Dutch newspaper Telegraaf reported Wednesday. A maintenance man at the Sinai Jewish center discovered two bullet marks on a window near the main entrance to the building. The bullets did not penetrate the bullet-proof window. No injuries were reported in the attack and the motive for the shooting is unclear at this time. The facility serves as a Jewish mental health center. Police in Holland launched an investigation into the incident, and security officials said they are looking into the possibility that the attack was related to recent tensions in the Middle East. Police officials confirmed that shots were fired but refused to provide further details. Police officers examined the scene and also questioned the residents of an old-age home nearby. Meanwhile, officials at the Sinai Center declined a response to the attack, saying they are waiting for the results of the police probe. Two weeks ago, an attempt was made to torch a synagogue in the southern section of Amsterdam. Dutch authorities reinforced security around Jewish community buildings in the wake of Operation Cast Lead in the Gaza Strip. A local party submitted an inquiry to the government over the shooting Wednesday. Meanwhile, the Foreign Ministry in Jerusalem told Ynet that the issue was being looked into via Israel's embassy at The Hague. See all talkbacks "Dutch Jewish center attacked"